Never send me to Neverland. It’s filled with souls who refuse to grow up. And boy are we experiencing some growing pains. It hasn’t been our shining week. The principal to whom one of my kids was sent assures me that “it’s all a process.” By that does she mean a process though which I might lose my mind? Then my other kiddo had an altercation which required words with the teacher. Now I know for certain where I have been sent: Never-Lord-of-the-Flies-Land. In this magical place I am trying to govern with limited success. Here, where mermaids are adored and loin clothes are sported, good spars with evil, yielding an uncertain outcome each and every time. Daily I am left to wonder if civilization and righteousness are taught or inherited? 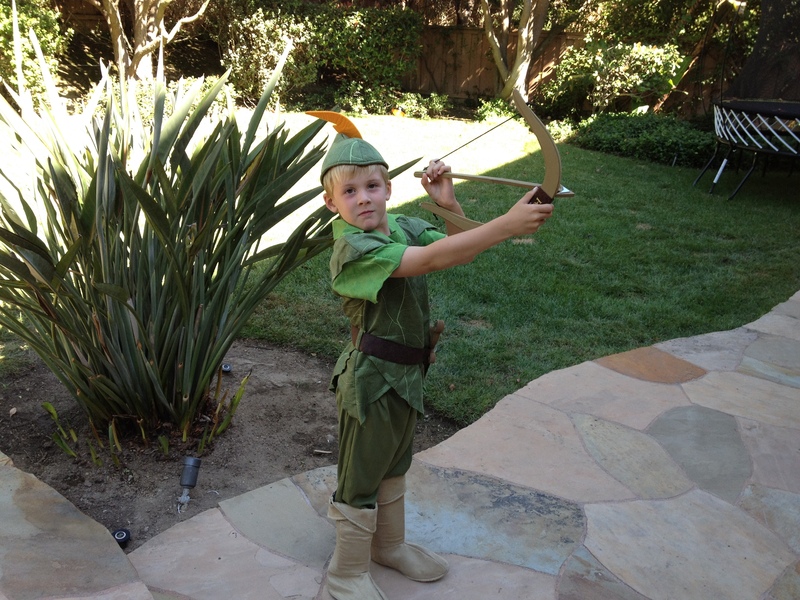 I look at my son who admittedly makes a darling Peter Pan. Note, I did not choose to share the photo in which he depicts Peter Pan’s death scene, with foam dagger situated across throat and arrow positioned in a rather unfortunate, not to mention sensitive, area. Lord of the Flies indeed. I wonder about innocence and promise; can they be maintained, and moreover, if they are lost can they be reclaimed? It’s impossible not to think of my father on this day, which marks three years since his passing. I remember him at his finest– an individual of grace and integrity. He was larger than life, but at some point, as proved by fantastic black-and-white photos he, too, had been young and impressionable, testing personas from cowboy to boy scout. I see my son in those photos, and I see my father in my son. Should he be so lucky to turn his own measure of promise into a life so fulfilled . I’d love to know if my father had any mischievous moments or perhaps a meeting with the principal? Let’s pretend it was possible, because then I’d have hope that we might eventually depart Never-Lord-of-the-Flies-Land with innocence intact and promise to nurture. Whether we decide to grow up or we wait for rescue we will emerge having conquered the process. How Does Justin Bieber Do That?